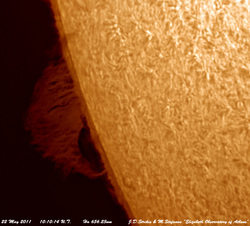 Our Solar section is working since 2004 and provides the amateur astronomers and the astronomical comunity with daily reports of the solar activity in Chromosphere (Ha' line: 656.23nm) and in Photosphere (540nm). Vsisit our "Archive" of Solar Observations and find the history of the Sun to get alive infront of your eyes. The Solar System section is a place with continuing updates during the observing periods of the different planets. Our priority is to record planetary images in high resolution as much as possible and deliver images of schientific value.